1837 Entire from Exeter to Chard showing a fine boxed 퓜풊풔풔풆풏풕/풕풐/푩풍풂풏풅풇풐풓풅 in Black. 1840 17th NOV entire to Compton Bishop and showing a SUPERB Parkstone/Penny Post, DT 347. 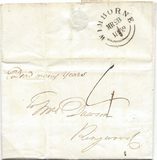 1835 Cover to Exeter showing a very fine Woodyates/Penny Post and a No. 1 Receiver of Thickthorne, DT 750. 1778 Entire to Dorchester showing a very fine straight line LYME, 32 x 7 mm, DT 302. 1840 A local cover with, on the front, a Shaftesbury /Py P. in Red, known in red in 1840 only, and MARNHULL No. 6 Receiver mark. 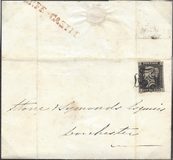 1836 Cover addressed to Manchester with a Shaftesbury/Penny Post (Dorset) and DONHEAD (Wiltshire) No 1 Receiver, both on the front. 1840 Dec 25th CHRISTMAS DAY entire to Shaston (another name for Shaftesbury circa 1831) showing a Gillingham No 5 Receiver and a BOXED 'SHAFTESBURY/PY P.' in ORANGE, DT 461 - Listed in Red in 1840 only. INTERESTING CONTENT LISTING THE CONTENTS OF A HOUSE FOR AUCTION. 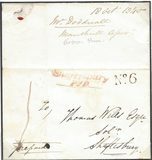 1838 Entire addressed to Blandford with, on the reverse, a very fine WOODYATES UNDATED CIRCLE, DT 746. 1797 Entire from Col N. Sneyd (Weymouth Camp) to his land agent in Newcastle under Line and showing a VERY FINE CONCAVE WEYMOUTH, DT 655. 1847 Entire to Sherborne from Portsea showing a very fine "Missent to/London" in black. 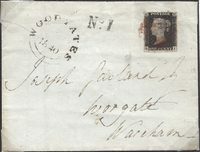 1856 1d Red-Brown, SG 29, tied to envelope to Dorchester by a fine Type II EXETER Sideways duplex, showing on the front a SUPERB MISSENT - TO/WEYMOUTH in black. Very Scarce. 1882 14 DOT 1d PALE LILAC, SG 171, tied to envelope to London by a WAREHAM duplex. 1825 Entire to Sherborne with boxed No 3 Receiving House on the front opening out to display a fine large format boxed SHAFTESBURY 5th Clause Post, DT 470. 1827 Entire from Wincanton (R. House '3') to Dorchester showing a very fine box SHAFTESBURY/5TH CL POST. 1782 Entire addressed to Blandford showing on the reverse a fine two-line DOR/CHESTER, DT 209. Interesting content written by "Cuming", a Doctor/Philosopher. 1782 Cover to London with, on the reverse, a fine circular-framed "SHERBORNE/POST/OFFICE/*", DT 505. Scarce. 1842 1d Red-Brown, SG 8, Plate 21, R-D, A very fine four-margin example tied to cover to London by a very fine LYME circular datestyamp, Spec B1va. 1842 SG 8o, 1d Red Brown, Plate 24, P-D, cancelled by a very fine BRIDPORT circular town datestamp.